Andreas Fath, a world-record-holding endurance swimmer and professor of Medical and Life Sciences at Furtwangen University in Germany, swims into Chattanooga, Tenn., Friday, Aug. 4, 2017, on the Tennessee River. Fath was collecting data as he swam on the Tennessee River. After 34 days and 652 miles in the Tennessee River, Andreas Fath's swim for science ended Tuesday at the river's confluence with the Ohio River near Paducah, Ky.
Fath, a scientist and professor of chemistry at Germany's Furtwangen University, swam about 20 miles a day to study the water and raise awareness for the importance of water quality. The world-record-holding endurance swimmer was not shy about why he chose to swim. It was a publicity stunt. He could have taken a boat and done the same research, but he wanted to raise awareness about the importance of water quality. 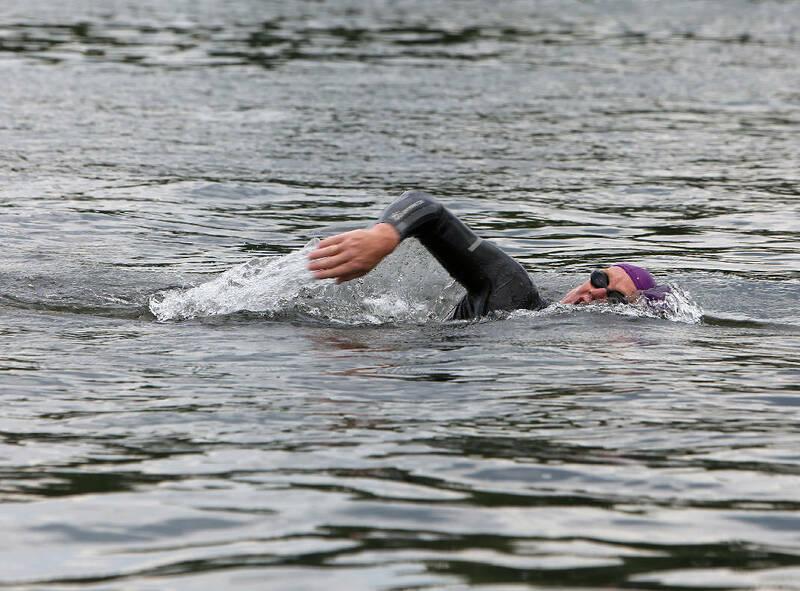 "I decided to bring two passions together, which is long-distance swimming and water science," Fath said. "I thought if I wanted to change something this was a good combination to reach people; more people than by writing a scientific publication." 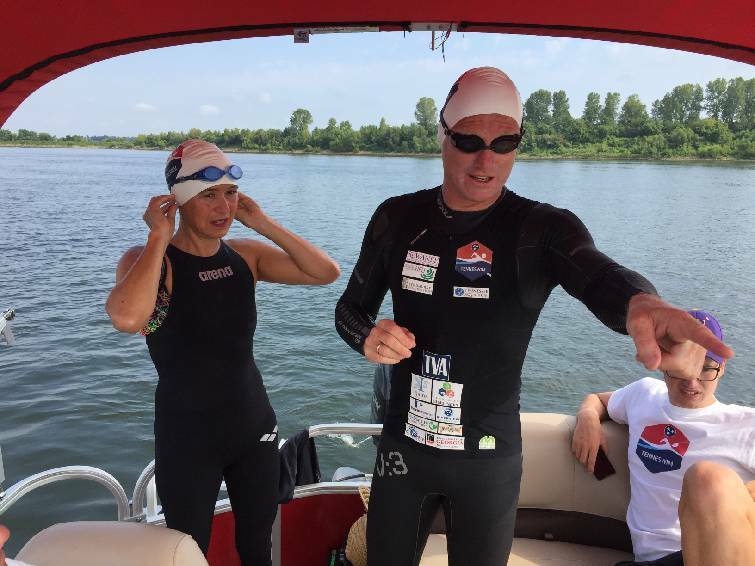 Andreas Fath and his wife Nicola prepare for the final leg of his swim through the entire Tennessee River Tuesday morning. Scientists on the trip took water samples that will be analyzed in the coming weeks to determine the health of the water and help in future studies. Samples will be sent off to groups for further research, while Fath and others study what's in the river and its impact on aquatic species in North America's most biodiverse watershed. The amount of plastic waste and other litter was of particular concern to Fath, he said. "If people are aware of their impact in this, maybe they would be willing and could change," Fath said. "If I can swim the Tennessee River, people could change their behavior a bit, and in sum, if everyone changes a bit, then we don't end up in 2050 with more plastic in our oceans than fish." The Tennessee Aquarium and its scientists were particularly excited about the journey and eager to study the upcoming results. "Anything that we can do to get people to think about what is in the water and ways they can help improve water quality is very important," said Thom Benson, director of external affairs at the Tennessee Aquarium. "From a scientific standpoint, our scientists and conservationists will be very interested in the actual results when Dr. Fath publishes that." Benson and Fath also stressed the importance of properly disposing of medicine. There are drug take-back programs across the state. Benson also encouraged residents to get involved with Tennessee River Rescue, an annual event in which citizens mobilize to clean the river on the first Saturday in October. 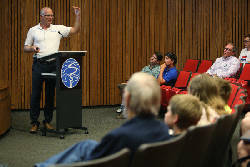 "Hopefully people have learned of Dr. Fath's TenneSwim event, they've learned a little bit more about microplastics and they think about ways they can reduce their single-use plastic," Benson said. Contact staff writer Mark Pace at mpace@timesfreepress.com or 423-757-6361. This story was updated Aug. 29 at 11:49 p.m.